The Canon 105mm Cross Screen Filter is a cross screen filter providing 4 reflected light points stemming from specular highlights within the image frame. When the filter is rotated in front of the lens, the points shift in direction but always reflect symmetrically. This effect is caused by thinly etched lines on one of the planes of the filter. 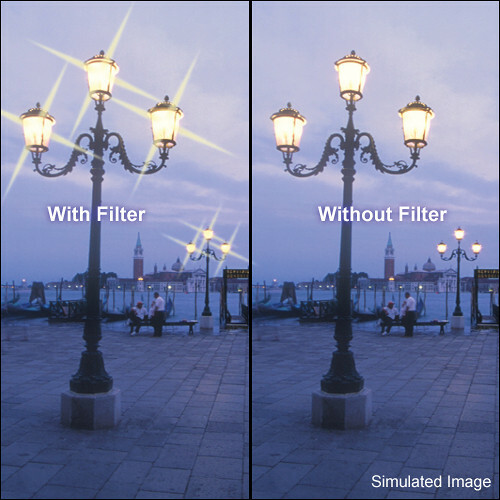 Star effect filters are most effective when not used in combination with other filters. This filter has a thread pitch of 1.0mm. Cross screen filter provides 4 reflected light points that stem symmetrically from specular highlights within the image frame. The reflected light points from this filter are long and most effective when oriented 45° in relation to the vertical axis. Reflected points of light change direction when filter is rotated. Star effect is caused by thinly etched lines on the filter surface and does not affect exposure or coloration of the image.